To take out the mechanical key, push the release button and take the key out. The mechanical key can only be inserted in one direction, as the key only has grooves on one side. If the key cannot be inserted in a lock cylinder, turn it over and reattempt to insert it. 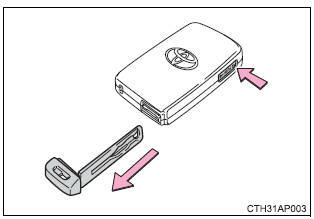 After using the mechanical key, store it in the electronic key. Carry the mechanical key together with the electronic key. If the electronic key battery is depleted or the entry function does not operate properly, you will need the mechanical key. for longer than about one second, an alarm will sound intermittently and the vehicle lights will flash to deter any person from trying to break into or damage your vehicle. To stop the alarm, press any button on the electronic key. Lock the glove box as circumstances demand. Vehicles without a smart key system: carry the master key for your own use and provide the attendant with the valet key. Vehicles with a smart key system: remove the mechanical key for your own use and provide the attendant with the electronic key only. New genuine keys can be made by your toyota dealer using a master key (vehicles without a smart key system) or the other key (vehicles with a smart key system) and the key number stamped on your key number plate. Keep the plate in a safe place such as your wallet, not in the vehicle. ¡½When riding in an aircraft when bringing a key with wireless remote control function onto an aircraft, make sure you do not press any buttons on the key while inside the aircraft cabin. If you are carrying the key in your bag etc., Ensure that the buttons are not likely to be pressed accidentally. Pressing a button may cause the key to emit radio waves that could interfere with the operation of the aircraft. If the wireless remote control function does not operate, the battery may be depleted. Replace the battery when necessary. As the electronic key always receives radio waves, the battery will become depleted even if the electronic key is not used. The following symptoms indicate that the electronic key battery may be depleted. Replace the battery when necessary. the smart key system or the wireless remote control does not operate. the detection area becomes smaller. the led indicator on the key surface does not turn on. The number of electronic keys already registered to the vehicle can be confirmed. Ask your toyota dealer for details. The key cylinder rotates freely to isolate inside mechanism. This device complies with part 15 of the fcc rules and with industry canada license-exempt rss standard(s). Operation is subject to the following two conditions: (1) this device may not cause harmful interference, and (2) this device must accept any interference received, including interference that may cause undesired operation of the device. Le present appareil est conforme aux cnr d'industrie canada applicables aux appareils radio exempts de licence. L'exploitation est autorisee aux deux conditions suivantes: (1)appareil ne doit pas produire de brouillage, et (2) utilisateur de l'appareil doit accepter tout brouillage radioelectrique subi, meme si le brouillage est susceptible d'en compromettre le fonctionnement. Warning: changes or modifications not expresly approved by trw automotive u.S. Llc could void the user's authority to operate the equipment. 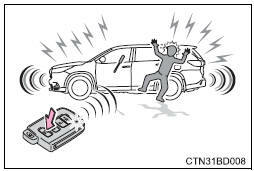 Do not drop the keys, subject them to strong shocks or bend them. Do not expose the keys to high temperatures for long periods of time. Do not get the keys wet or wash them in an ultrasonic washer etc. Do not attach metallic or magnetic materials to the keys or place the keys close to such materials. Do not disassemble the keys. Do not attach a sticker or anything else to the surface of the key with a wireless remote control function. 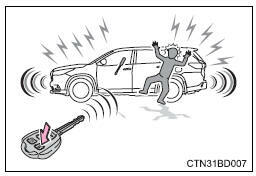 Vehicles with a smart key system: do not place the keys near objects that produce magnetic fields, such as tvs, audio systems and induction cookers, or medical electrical equipment, such as low-frequency therapy equipment. Carry the electronic key 3.9 In. (10 Cm) or more away from electric appliances that are turned on. Radio waves emitted from electric appliances within 3.9 In. (10 Cm) of the electronic key may interfere with the key, causing the key to not function properly. Take your vehicle with all the electronic keys provided with your vehicle to your toyota dealer. If the electronic key remains lost, the risk of vehicle theft increases significantly. Visit your toyota dealer immediately with all remaining electronic keys that was provided with your vehicle.